What's Swaging? Some sort of Pirate Walk? We are often asked what a "swaging" is, and yes, it's different from "swaggering" (for starters, it rhymes with ageing). A swage connects rigging hardware (toggles, studs) to lifeline or rigging wire. It requires a sophisticated swaging machine which employs dies to force hardware onto the wire. We perform this labour in-house using roller swaging, which maximizes the amount of contact between hardware and the wire forged within. 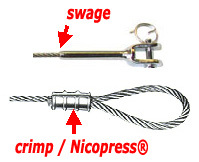 On the other hand, crimping (brandname Nicopress) uses sleeves which are crushed into wire. This method is great for applications that do not require high strength or reliability, such as cable locks or pennants. We also provide this labour at Pride Marine.